A Firewall is a software based security program, which protects the computer from viruses, hackers and worms. In computing, a firewall is a software or hardware program that prevents the computer from being hacked. It acts as a protective wall between the viruses and the computer. It provides the network security system, which controls the incoming and outgoing network traffic. The network traffic hence analyzes the data packets and determines whether the content should be allowed through or not, based on applied rule set. 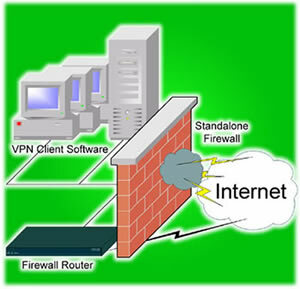 A firewall establishes a barrier between a trusted internal network and the Internet. The internet is assumed to be not secured as it contains several types of viruses, worms and hackled content. It is a system which is designed to prevent the unauthorized accesses, which are obtained from the browsing done by internet or intranets. It keeps the private network like the personal computer away from the browsing problems. Network layer or packet filters: This layer operates at a relatively low level of the TCP/IP protocol stack, and does not allow the packets to pass through the firewall unless they match the established rule set. Application-layer: This layer works on the application level of the TCP/IP stack and intercepts all the packets traveling to or from an application. They especially block the unauthorized packets. Proxies: A proxy server is a gateway from one network to another for a specific network application, and functions as a proxy on behalf of the network user. Network address translation: Network address translation (NAT) is a firewall functionality, which hosts and acts as a protected shell behind a firewall. They commonly have addresses in the "private address range".